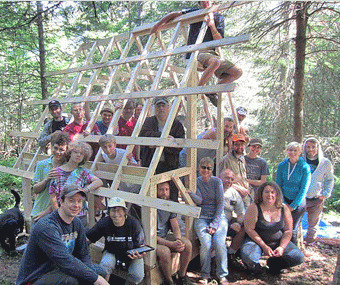 Greener on the Other Side: Who Put the Fun in Sustainable Architecture? October is National Energy Awareness Month, and the movement toward environmentally friendly construction has been motivated by ethics, finances, the housing crisis, and ecological concerns. And a bit of fun. In 1956, David South heard Buckminster Fuller talk about domes. Two decades of ruminating, researching and experimenting later, South and his brothers built their first Monolithic Dome in 1976. By 1979, South had a patent on it. The rounded shape contributes to energy efficiency, typically saving about fifty percent on heating and cooling costs compared to a comparable conventional building. In addition, a Monolithic Dome uses the least amount of materials and requires the smallest surface area to enclose space. And it is virtually maintenance-free: no siding to paint, roofs to fix, or termites to exterminate. 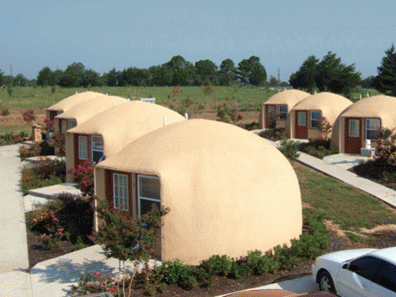 In addition, Monolithic Domes have gotten the highest FEMA rating for safety. Remember the party trick of squeezing an egg with uniform pressure, but surprisingly it doesn't break? Spherical shapes are not only a comforting, feminine form (we all gestated in one! ), they are also the strongest form in nature. I'll let you draw your own symbolic conclusions. 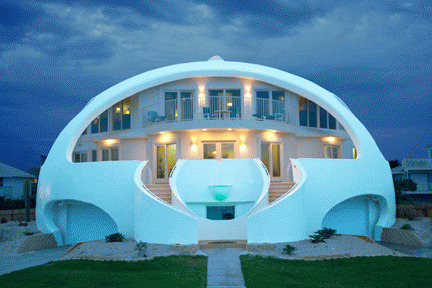 Mark and Valerie Sigler's "Dome of a Home" in Pensacola FL survived Hurricane Ivan in 2004 (as well as hurricanes Dennis and Katrina in 2005) when other structures nearby were destroyed. Their book "Building in the Danger Zone" is available free at http://www.domeofahome.com. Airformed concrete domes are almost indestructible, and can withstand over 300 mph winds, storm surges, termites, fires, and earthquakes. 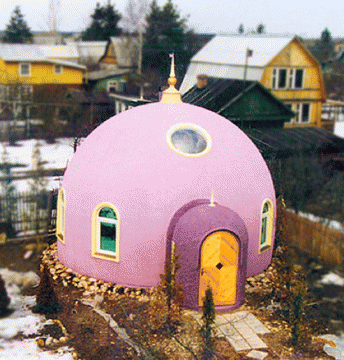 Domes seem to inspire creativity and imagination. 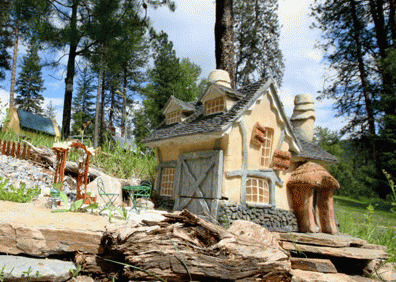 The magical Hobbit House of Montana is a dome home retreat that is built into the side of a hill, and features Bilbo Baggins' house and a statue of Gandolf on the grounds, along with an elven village and fairy houses. Only grownups allowed! David South has designed economical, 314 square feet dome units that can be used as "cabins in the woods," rental units, or efficient replacement housing after natural disasters. The annual Monolithic Dome Tour is held in the fall of each year. 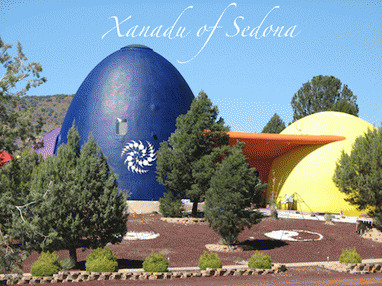 It's always exciting to see the inside of a dome home - I've visited quite a few, including Xanadu in Sedona, AZ. Another tour of green architecture, the ASES (American Solar Energy Society) National Solar Tour, is the world's largest grassroots solar event and takes place annually on the first Saturday in October. It is coordinated by the nonprofit ASES, (http://ases.org/ ) in collaboration with dozens of partner organizations. Over 170,000 participants are expected to visit some 5,500 buildings in 3,200 communities across the U.S. during this year's tours on Sat. Oct. 6 and Sun. Oct. 7. 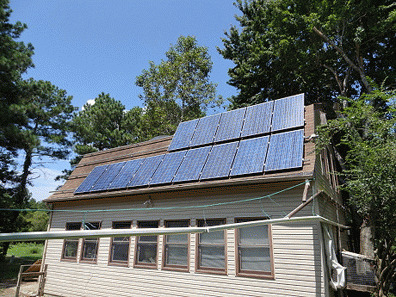 The Solar Home Tour in Hampton Roads, VA, is part of the national tour. Ken Wright, a retired engineer, is facilitator of the Hampton Roads Solar Homes Group which is cosponsoring the event. (Tour info at http://www.hrsolartour.com ) Wright notes that this local event is a free, self-guided tour of over two dozen Hampton Roads homes and businesses that use solar energy, energy efficiency, and other sustainable technologies to reduce their monthly utility bills. The Delhaise/Amundsen home, is on the tour, and features a 21-panel solar electric system that provides nearly all the electricity needed for the 3450-square-foot home. Another house on the Hampton Roads tour was designed by Richard Fitts of The Design Collaborative, Norfolk, VA. (http://designcollaborative.cc) Fitts is a progressive architect whose passive solar design for his own home was selected for a Solar Design Award in 1978. 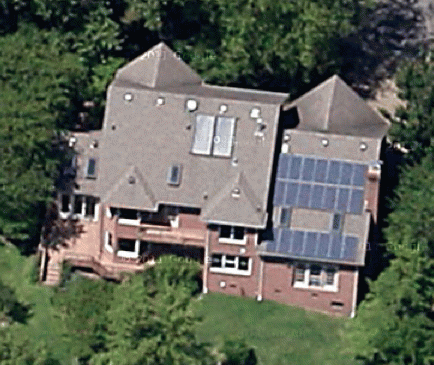 He notes, "I designed the house, itself, to be the solar collector." The competition was sponsored by the U.S. Dept of Housing and Urban Development in cooperation with the U.S. Dept. of Energy. Fitts won $5000, a large enough chunk of change in those days to make a significant start on construction. His strategically placed windows take advantage of the sun's natural cycles and provide a stunning view, but Fitts says that what he likes best is the personal feeling it gives him of "being in touch with the rhythm of nature." He says, smiling, "for me, the energy crisis has turned out to be an opportunity, instead of an obstacle." 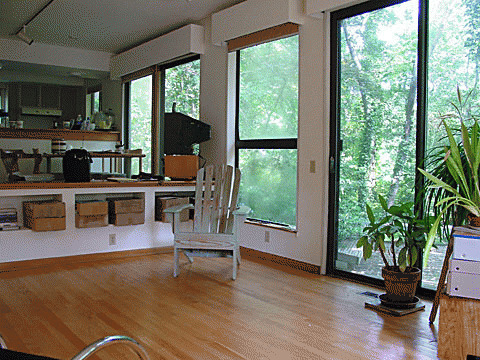 The passive solar home designed and built by Jim and Genny Jacobs in 1982 is also on the tour. Jim notes that "the rainwater system collects water from all the building gutters and directs it through a series of channels to a 2000 gallon cistern which is used for watering plants during dry spells." 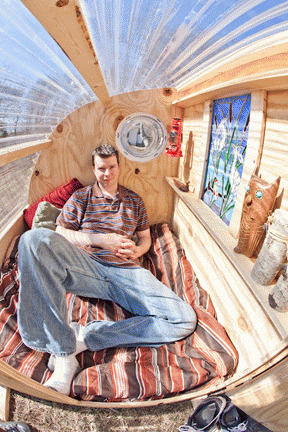 Jay Shafer, founder of Tumbleweed Tiny House Company is considered the father of the tiny house movement. 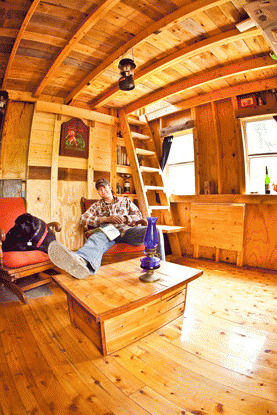 In 1997 he built and moved into his first tiny house, all 89 square feet of it! He's been living in tiny houses ever since, and loving it. And while these house are environmentally sound, Shafer has another reason for going green: personal freedom. In "The Small House Book" Shafer says, "The key to designing my happy home really was designing a happy life, and the key to that lay not so much in deciding what I needed as in recognizing all the things I can do without " Like anything else that is not essential to our happiness, extra space just gets in the way. It requires maintenance and heating, and ultimately demands that we exchange a portion of life for the money needed to pay for these extras." 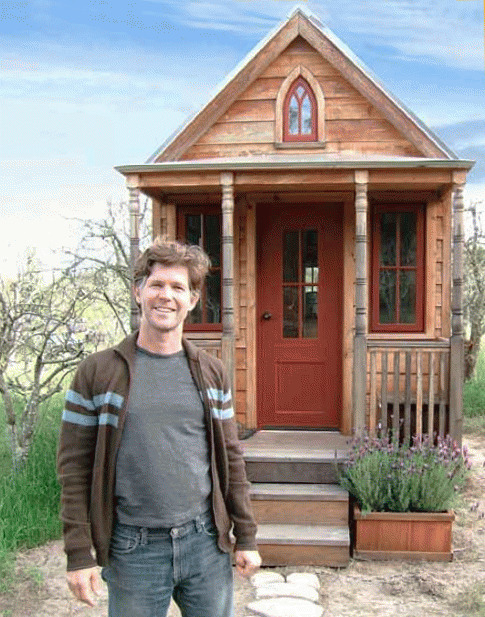 After perfecting his design for his tiny house, Jay discovered that it was too small to be built legally in most places in the US. 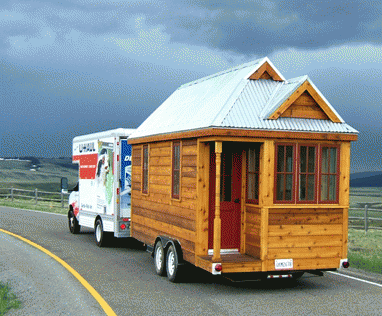 Undaunted, he simply added wheels: as a portable home, the size was perfectly legal. I was invited to observe a Tumbleweed workshop the last weekend in June in Washington, DC, facilitated by Derek "Deek" Diedricksen, author and creator of small dwellings. "Upbeat and fun" just barely describes his presentation: imagine a mix of architect Antoni Gaudi, inventor Rube Goldberg and "What, me worry?" Alfred E. Neuman on speed, and that's Deek. Held at the new American Institute of Architects building, the workshop was a compendium of tiny house planning and building tips, tools, appliances and building code considerations. 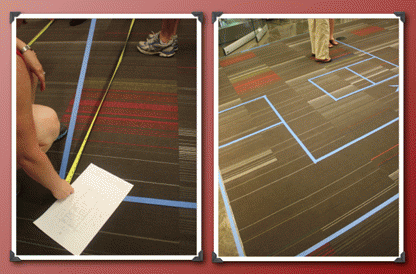 During part of the class, participants taped out three of the Tumbleweed Tiny House floor plans with blue tape, so we could walk around in them to get a feel for the size. I was staying nearby, in a cozy little suite at the historic Harrington Hotel. So, when I returned from the event, I measured the suite, and discovered it could hold at least four Tumbleweed homes in its square footage! After the DC workshop, Deek headed for his Tiny House Summer Camp in Vermont where participants who overnight in his quirky guesthouses would build two new tiny houses together. 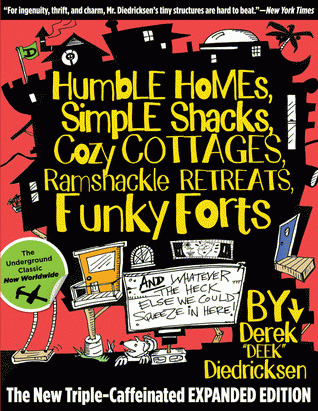 Deek is author (he calls himself "concoctor") of the book "Humble Homes, Simple Shacks, Cozy Cottages, Ramshackle Retreats, Funky Forts: And Whatever the Heck Else We Could Squeeze in Here." It's a "Wordless Workshop" meets R. Crumb pictorial manual that's a veritable escapade into "triple caffeinated" creativity. Entertaining and unconventional, he'll inspire even if you never actually pick up a hammer. Underneath the humor and zaniness, is a heart of gold. 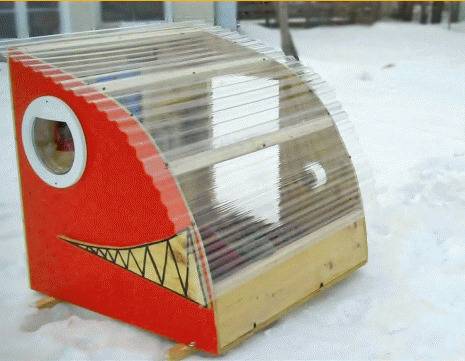 Deek's "GottaGiddaWay" Homeless Shelter/Camp Prototype was inspired in part by a desire to develop economical, protective housing for the homeless. Check out Deek's YouTube videos in "Tiny Yellow House" in conjunction with "Make" magazine here , described as "This Old House meets Wayne's World," and join in the fun green housing revolution! 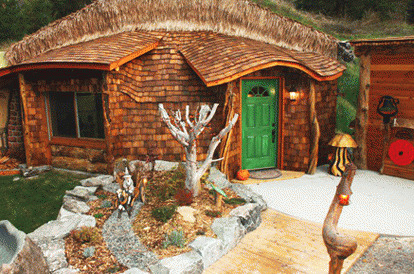 View All 2 Articles in "Tiny House Movement"